Production: Universal; black and white, running time: 76 minutes. Released May 1935. Producer: Carl Laemmle Jr.; screenplay: John L. Balderston, William Hurlbut, from the novel by Mary Shelley; photography: John D. Mescall; editor: Ted Kent; art director: Charles D. Hall; music: Franz Waxman; special effects: John P. Fulton; make-up: Jack Pierce. Gavin Gordon ( Lord Byron ); Ted Billings ( Ludwig ); Lucien Prival ( Butler ); John Carradine ( Woodsman ); Walter Brennan ( Neighbour ); Billy Barty ( Baby ). Riley, Philip J., editor, Bride of Frankenstein: The Original Shooting Script , Absecon, New Jersey, 1989. Butler, Ivan, Horror in the Cinema , revised edition, New York, 1970. Goldblatt, Burt, and Chris Steinbrunner, Cinema of the Fantastic , New York, 1972. Bojarski, Richard, and Kenneth Beale, The Films of Boris Karloff , Secaucus, New Jersey, 1974. Derry, Charles, Dark Dreams: A Psychological History of the Modern Horror Film , New York, 1977. Ellis, Reed, Journey into Darkness: The Art of James Whale's Horror Films , New York 1980. Curtis, James, James Whale , Metuchen, New Jersey, 1982. Manguel, Alberto, Bride of Frankenstein , Champaign, Illinois, 1997. Time (New York), 29 April 1935. New York Times , 11 May 1935. Variety (New York), 15 May 1935. Film Weekly (London), 28 June 1935. Monthly Film Bulletin (London), July 1935. Durgnat, Raymond, "The Subconscious: From Pleasure Castle to Libido Motel," in Films and Filming (London), January 1962. Jernsen, Paul, "James Whale," in Film Comment (New York), Spring 1971. Huss, Roy, "The Creation Scene in The Bride of Frankenstein ," in Focus on the Horror Film , edited by Huss and T. J. Ross, Englewood Cliffs, New Jersey, 1972. Evans, Walter, "Monster Movies: A Sexual Theory," in Journal of Popular Film (Washington, D.C.), Fall 1973. Milne, Tom, "One Man Crazy: James Whale," in Sight and Sound (London), Summer 1973. Evans, Walter, "Monster Movies and Rites of Initiation," in Journal of Popular Film (Washington, D.C.), Spring 1975. Starburst (London), no. 33, 1981. Viviani, C., "Fausses pistes," in Positif (Paris), June 1983. Senn, Bryan, "The Monster, Bride, and Son. . . ," in Monsterscene (Lombard, Illinois), no. 4, March 1995. Senn, Bryan, "Elsa 'The Bride' Lanchester: A Candid Look at the Fairest Monster of Them All!" in Filmfax (Evanston, Illinois), no. 58, October-January 1996–97. Henderson, J.A., and G. Turner, "A Gothic Masterpiece," in American Cinematographer (Hollywood), vol. 79, January 1998. 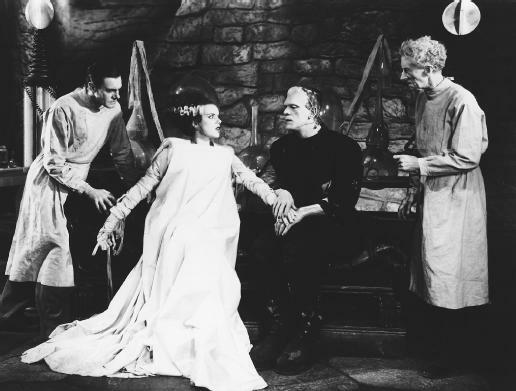 By 1935, James Whale knew the days were numbered for Universal's monster machine and offered The Bride of Frankenstein as the panacea to out-do any encroaching horror parodies. While the most technically proficient, lavish, and spectacular horror movie of its time, Bride remains the brainchild of a director grown jaded and even a bit masochistic about Frankenstein' s unsurpassable success. Whale was so effective in making Bride a swansong to his genre that all subsequent scare comedies from Abbot and Costello Meet Frankenstein to Mel Brooks's Young Frankenstein are redundant. Bride' s anti-horror tone is evident from the very first scene with a literary badinage between the author Mary Shelley (Elsa Lanchester) and her cohorts Lord Byron (Gavin Gordon) and husband Percy (Douglas Walton). Despite the missing additional dialogue (excised before the film's release), this interlude is still among the most memorable and funny historical reconstructions in screen history. As Gordon's Byron commends Mary for conceiving her story, he rolls his r's like the worst of hams. Elsa (as Shelley and later as the "bride") jerks her head, contorts her eyes, and titters like a hyper-neurotic version of Brigitte Helm's robot in Fritz Lang's Metropolis. It is no wonder that these moments alone would inspire Ken Russell's funhouse romp in Gothic a half-century later. However, once the film picks up from where the first left off, we notice how much has radically changed. Comical E. E. Clive replaces the more leaden Lionel Belmore as the town burgomaster in charge of keeping bogus order. Amidst the screaming throng, Una O'Connor (as the chambermaid Minnie) and her cacklings provide a blithe foil for Karloff's Monster. Here the Monster is reduced to a straight man when he emerges from the windmill's ruins and stands beside O'Connor—a shot that is as embarrassing as it is hilarious. Along with the constant punch-lines and jocular atmosphere, Bride of Frankenstein is best distinguished by Franz Waxman's heavy-handed musical score which punctuates every gesture and leaves little room for subtlety or grace. Whale neutralizes the chills with bathos when the Monster talks (an addition to which Karloff objected). There is studied anachronism when Lucien Prival plays a butler who actually resembles a 1930s-style gangster. The film even satirizes Tod Browning's Devil Doll when the mad Dr. Pretorius (Ernest Thesiger) shows off his miniature life forms to induce Henry Frankenstein (Colin Clive again) to return to his electrodes and cadavers. Even the stately laboratory sequences (so creepy in the first film) are played for laughs with overly lit and distorted close-ups on the grimaces of Thesiger and Clive. Of course, there is the bride's long-awaited unveiling accompanied by wedding bells, a ceremony ruined by her shrewish hisses when the Monster arrives to claim his mate. So well does Whale slip the micky into any potential fright that he spawns a Bride of Frankenstein Syndrome which, to this day, afflicts such other morbidity moguls as George Romero and Tobe Hooper who camp up their sequels to avoid living up to their previous standards. While demystifying the horror, Whale does, however, manage to weave more subversion into this Hays-era production than in any of his other films. The slant on sacrilege (already present in Frankenstein ) is here augmented ad absurdum. Kitsch Catholicism looms over almost every scene. A maudlin church organ accompanies the prayers of thanks of the blind hermit (O. P. Heggie) when the Monster pays him a friendly visit; then the scene fades out on a glowing crucifix. The Monster is even captured by townspeople and pilloried Christ-style; later he desecrates a graveyard effigy of a bishop. Among Bride' s assortment of twisted characters, Thesiger's Pretorius (a part intended for Claude Rains) is the consummate scene-stealer who, after all, sets the story's plot in motion. Beneath his Satanic surface, he is the only character rooted in his own ethics, as compared to Frankenstein (who is now even more flaky and hypocritical about Christian notions of "good" and "evil"). He is also most likely closest to Whale's own predilections. While inveigling Frankenstein to participate in the second creation, Pretorius looks coyly upon his former pupil and utters the darkly romantic line: "Alone you have created a man. Now, together we will make his mate." Like Charles Laughton's Dr. Moreau in Island of Lost Souls , Pretorius's sexual ambiguity suggests a counter-Eden where homosexuals give birth to heterosexuals. Whale's unabashed gayness, visible in most of his other films, is most evident in Bride , which, behind the cheap laughs, provides an inventive and audacious fantasy that stands the Genesis tale on its head and outwits all future imitators.